We are delighted to bring this superb Gallantry Medal group to the market, directly from the family of the recipient. 1st Battle of Sedjenane, Tunisia Campaign Theatre of War February 1943, Military Medal Group. This very fine group of 7 medals, swing mounted as worn, consists of Military Medal, 1939/45 Star, Africa Star with 1st Army Clasp, Italy Star, Defence Medal, War Medal and Territorial Efficiency Medal. 46th Division 5th Corps – 46th Divisional Signals. From 23rd Feb 43 to 28th Feb 43 Sigmn BUCK was responsible for the maintenance of line communications in the area between EL ALOUANA and the enemy positions to the EAST. Being the only lineman in this area with a thorough knowledge of the lines, Sigmn BUCK was out almost continuously for six days repairing faults under very heavy shell and mortar fire. He completed every assignment with commendable tenacity, never once failing to restore service on any broken line. It is only through his keen sense of duty and utter disregards for his own personal safety that it was possible to maintain line communications during this period. 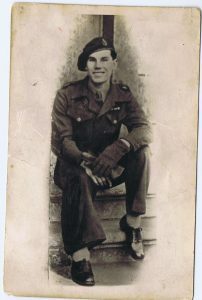 Sigmn BUCK was wounded on 28th February 1943 whilst in the act of repairing a line under direct enemy observation. An article “blood and sand do not mix” give some accurate detail of the immediate vicinity wher Buck was wounded. 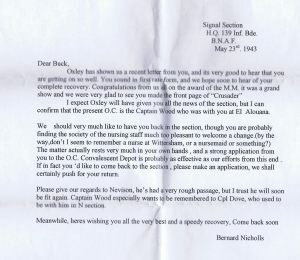 Original handwritten letter and typed transcription of a letter sent to BUCK by Bernard Nicholls, Signal Section, HQ 139 INF BDE. B.N.A.F. May 23rd 1943. It was addressed to BUCK at No. 4 Coy. No 9 Convalescent Depot, B.N.A.F. 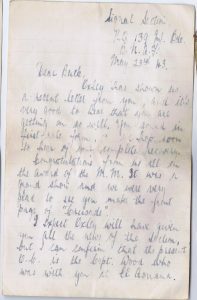 Images of this letter can be seen on this page. Original photograph of him seated on a step. His MM ribbon can be clearly seen. The reverse has his name hand-written with the place and date ROME DEC 25 / 44. 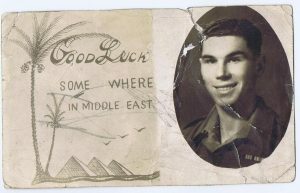 A small portrait on a thin card with the caption Good Luck Some Where in the Middle East. This has a small portrait and his MM ribbon can be clearly seen. This paper is torn. 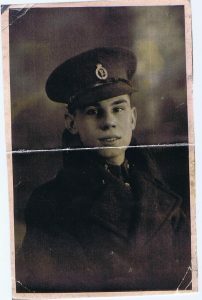 Copy of a photo of him on his 17th Birthday in Leeds 1939 in Uniform. 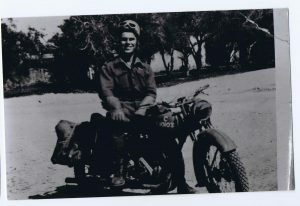 Undated copy of an image of him on a Motorcycle. 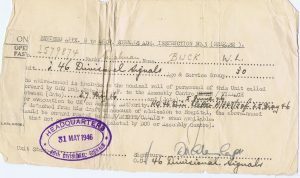 His Record of Service Card. Dated 13th June 1946 it confirms his service 18th April 1939 to 7th Sept 1945. Dated 2nd May 1945 a copy of the congratulatory note to all servicemen in the Mediterranean Theatre from Field Marshall Alexander. 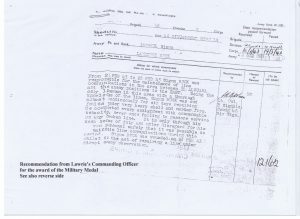 Original Release document instructing him to the Assembly Centre at Villach for evacuation to UK. His Pay Book. His Military Driving Licence. 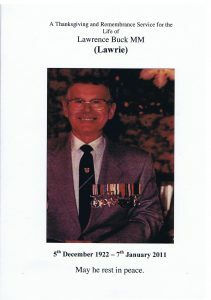 His Memorial Thanksgiving and Remembrance Service Order of Service has a very fine photograph of Lawrie Buck MM wearing this group of medals. 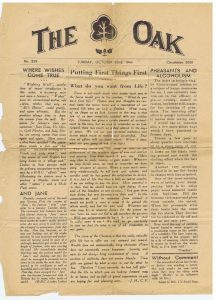 Finally, a page of THE OAK, published Sunday October 22nd 1944. Issue number 329. Circulation 3000. This lot also come with a copy of the privately produced book THE STORY OF THE 46 DIVISION 1939 – 1945 . Chapter 1 of this fine book covers The Tunisian Campaign. The 1st Battle of SEDJENANE is covered on pages 24 to 27. There is also a map on which Lawrence Buck has indicated where he was wounded – near Jefna Station between the 3 renowned hills named Green Hill, Baldy Hill and Sugarloaf. This group has been sourced from the direct descendant of the recipient. Sejenane was a wayside railway town in the wet cork forests on the way to Mateur. Whoever held Mateur held Bizerta, and whoever held Green and Bald Hills outside Sedjenane held Mateur.” — Alan Moorehead. On February 26, 1943, the Germans broke the stalemate with Operation Ochsenkopf (Ox Head) offensive, a complementary blow to the Kasserine Pass offensive earlier that month. In a subsidiary operation Unternehmen Ausladung, the Axis attempted to outflank the British troops in Sedjenane and on the high ground opposite “Green Hill”, with an attack on the hilly coastal strip to the north between the town and Cap Serrat, which was only lightly held by poorly-equipped French troops of the Corps Franc d’Afrique. The German advance, led by Colonel Rudolf Witzig‘s Parachute Engineer Battalion, was held by a series of counter-attacks by the 16th Battalion, Durham Light Infantry, of 139th Brigade of British 46th Division, and two troops of No. 1 Commando on February 27, 1943, supported by the 70th Field and 5th Medium Regiments, Royal Artillery. 16 DLI mounted a further, disastrous counter-attack at dawn on March 2, 1943 in which it suffered severe casualties. That afternoon, the Germans also successfully advanced from the east towards Sedjenane and broke through the ranks of the 5th Battalion, Sherwood Foresters, also of 139th Brigade. 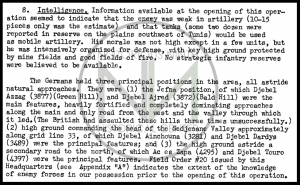 According to Associated Press war correspondent Don Whitehead, an Italian infantry battalion (from the 10th Bersaglieri Regiment ) supported by 30 tanks counterattacked in the British sector on 3 March, but lost half its strength killed to machine-gun fire. 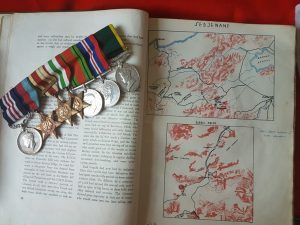 Posted in 1939/45 Medal, 1939/45 Star, 1st Army, africa star, Antiques, Battle of Sedjenane, BATTLES, Defence Medal, France and Germany Star, italy star, London Gazette, medals, Medals, Mentioned in Despatches, military medal, MM Military Medal, Operation Torch, Royal Corps of Signals, Royal Signala, Territorial Force War Medal, Tunisia Campaign, War Medal, World War 2Tagged 46 DIVISION, battle for north africa, Battle of Sedjenane, Bersaglieri Regiment, blood and sand do not mix, Colonel Rudolf Witzig, Corps Franc d'Afrique, jefna station, Kasserine Pass, military medal, Operation Ochsenkopf, Operation Torch, territorial efficiency medal, the oak, Tunisia Campaign, ww2Bookmark the permalink.